Today it is my turn to be up on the Little Blue Button Stamps Blog to showcase a wonderful Easter project. You have to go and stop by and check it out because all month long, the designers have been bringing the inspiration! I decided to keep my Easter card very clean and simple. 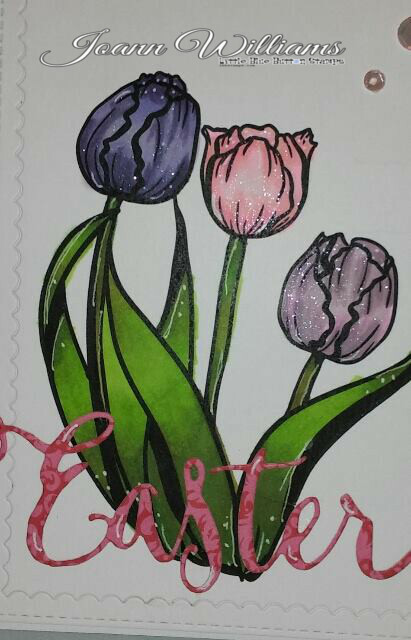 I wanted the focus to be on the image and for this card, I used the beautiful Tulips digital stamp. Tulips are my favorite flower and I just knew these would look beautiful on a card for Easter. I printed the image out onto some Bristol smooth cardstock and colored the image in with my copic markers. I like working with the copics with the Bristol paper as well. For some reason the alcohol pens blend so much more smoothly. Once the image was colored, I added some white pen doodles and then cut it out using the scalloped edged border dies from My Favorite Things. 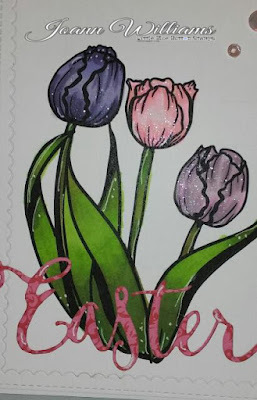 The Easter word die is from Simon Says Stamp and was cut out of some Carta Bella Paper. 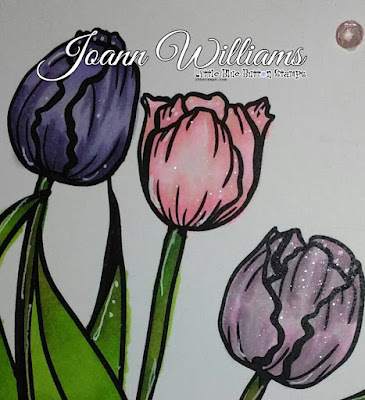 I added in a few sequins in the upper right corner to bring this card together and added some glitter to the tulips using my spectrum noir clear sparkle pen. And as you can see from the photo, I went out of the lines a bit when coloring! That is what happens when you are in a lot of pain and trying to keep as still as can be! But it is the beauty of a handmade card, right? Hope you like! 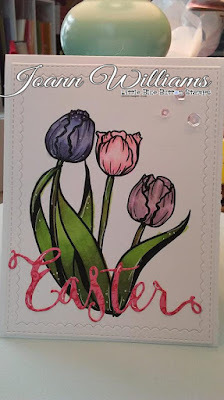 Please make sure to stop by the Little Blue Button Stamps Blog to see more gorgeous Easter projects! You will surely be inspired to make some of your own!! If you want to purchase the Tulips digital stamp or any other stamp you may have been eyeing up, just go visit the LBBS Store. Thank you so much for stopping by today and have a great day!!! Gorgeous card. Love the tulips. Very pretty, Jo. I love the sparkle you added, too. Beautiful card Jo! I love the image and you colored it perfectly! I love the rich colors and pretty touch of sparkle! So pretty! Super pretty and love the little touch of sequins, too. Such a beautiful card my friend!! I love the pretty tulips! Love the touch of sparkle you added. The Easter word die is Awesome! Simple, Stunning and Beautiful! Love your coloring!